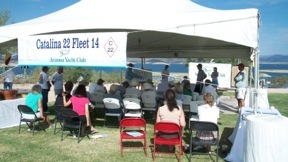 Christina and Steve Campo organized an amazing clinic day for Catalina 22s on Saturday, September 22. A herd of C22s came out for the event, plus many new people interested in trying this racing thing. In the pictures taken by Tom Errickson, you’ll see the tent, the group, the boats on the water—and you’ll get a small sense of the energy. 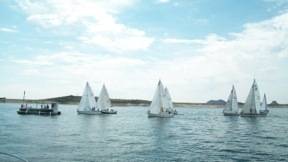 On the same day, George Sheller organized a clinic for Laser sailors at Tempe Town Lake and it turned out to be another exciting success, with lots of sailors and lots of learning and tweaking for the season. As a result, there are a herd of Lasers competing in the TTL fall series. 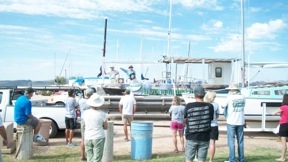 The C22 fleet was celebrating the 40th birthday for their boat, the venerable Catalina 22. Some of the boats that came out to play. 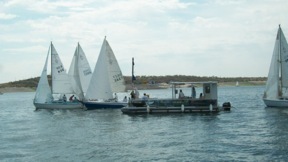 The fleet launched the AYC race committee boat and ran starts and races. Explaining the starting sequence from the deck of the race committee boat.